HaptX is on a roll lately. Whether it be remote telerobotics with real-time interactivity, or realistic touch in car design, it seems as though the advanced haptic glove is finding a home in just about every field, including healthcare. In a demonstration conducted during the annual general meeting of the American Association of Orthopedic Surgeons (AAOS), Fundamental Surgery–developers of a low-cost surgery simulation platform–showcased their FundamentalVR experience working in conjunction with HaptX’s haptic glove, delivering an unparalleled level of detail to the developers surgical education experience. 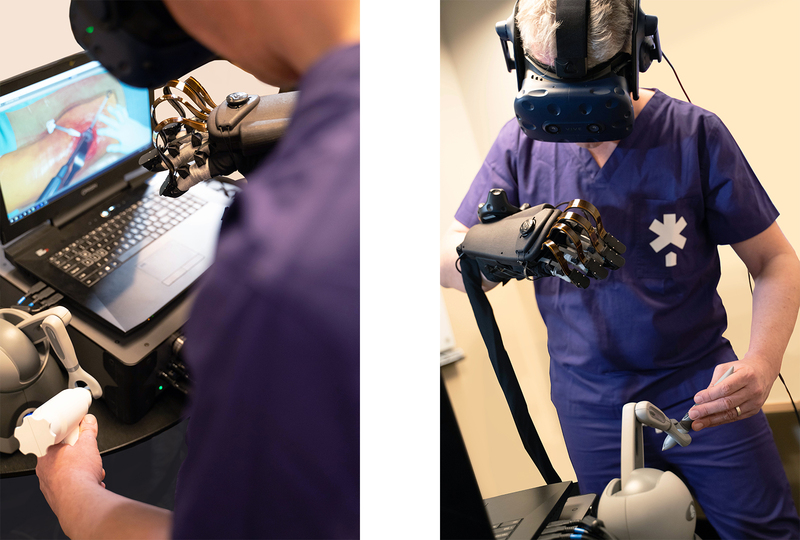 During the AAOS demonstration, Fundamental showcased an example of the HaptX glove working in tandem with their platform during an Anterior Total Hip Arthroplasty. The user can be seen carefully performing the operation using a HaptX glove to manipulate the patients tissue with detailed precision. Using the force feedback generated by the exoskeleton (up to 4 lbs of resistance per finger) the user is actually able to feel the boney growth surrounding the rim of the hip socket, allowing them to better locate key ligaments. 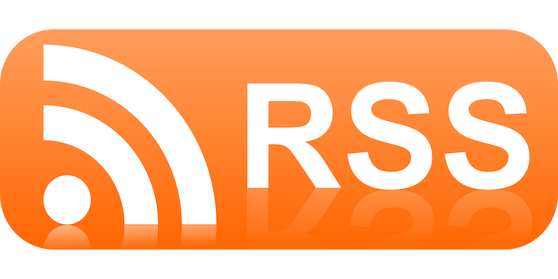 Fundamental Surgery is currently employed at various professional medical facilities across the US, UK, and Germany and offers support for Spinal Pedicle Screw, Total Hip Arthroplasty (Posterior), Total Hip Arthroplasty (Anterior), and Total Knee Arthroplasty. The platform is compatible with any laptop, VR headset, or haptic hardware. For additional information on Fundamental Surgery’s growing platform, visit fundamentalsurgery.com. For updates on HaptX’s haptic offerings, check out haptx.com. During the 1950’s Ralph Mosher, project engineer behind GE’s Cybernetic Anthropomorphic Machines Systems (CAMS), pursued the idea of using robotics as an extension of human arms in a way that could precisely mimic human movements in real-time. The project was called the Hardiman, which created a human/machine interface that not only gave humans the ability to “feel” through force feedback, but it also gave humans super strength. Mosher’s project was a breakthrough for GE, unfortunately the Hardiman exoskeleton (which looked a lot like the load-lifter that Ripley used to fight off the Queen Xenomorph in the 1986 film Aliens) never made it beyond the prototype stage. It was big and clunky, and after poor testing the project was eventually shelved. Mosher’s legacy lives on however, with multiple developers and organizations continuing the advancement of telerobotics. 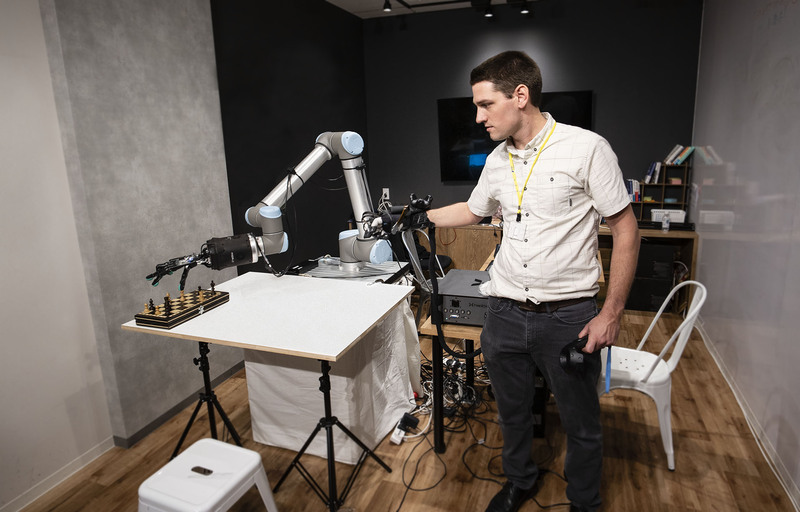 One partnership in particular has resulted in what the developers claim to be the first haptic telerobotic system that allows users to control a robotic arm remotely from anywhere in the world. By using HaptX haptic gloves, users are also able to feel what the robot feels through force feedback and sub-millimeter motion tracking. 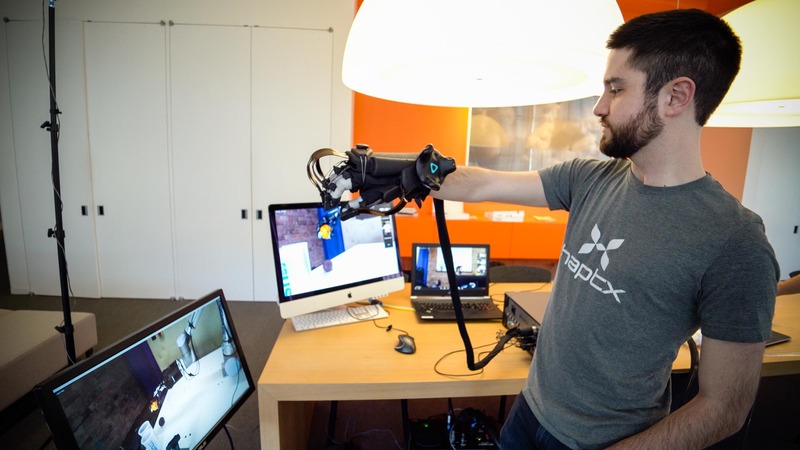 Labeled as the Avatar X initiative, the project is a result of a collaboration between HaptX–whose haptic gloves lets you grab and hold objects in VR–SynTouch, whose BioTacs SP sensors can detect haptic data of interaction to re-create a human sense of touch; and Shadow Robot Company, creators of Dexterous Hand – a robotic hand with 20 actuated degrees of freedom, force sensors, and ultra-sensitive touch sensors on the fingertips. Imagine you are inside your home while wearing a HaptX haptic glove connected to robotic hand located all the way in London via a 4G phone. 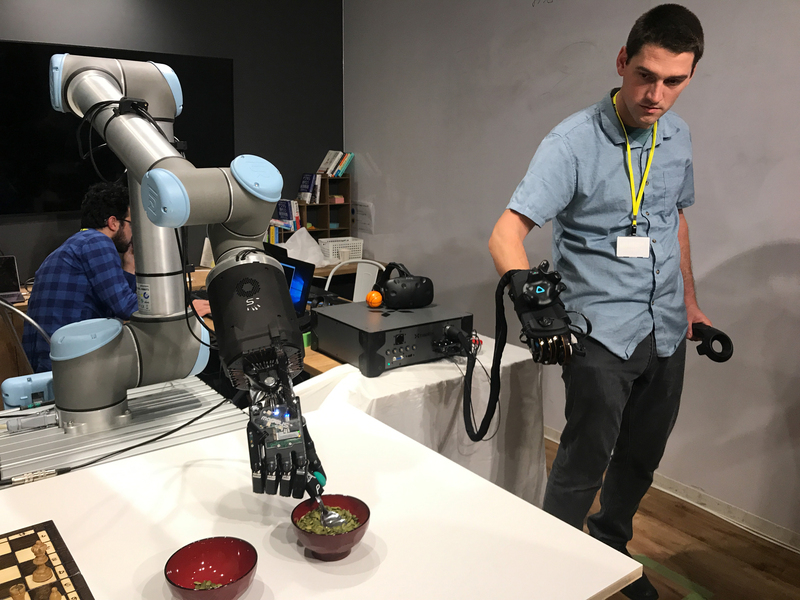 Using the haptic glove on your hand, you manipulate the movement of the robot to reach over and pick up a physical ball and hold it; all the while feeling the soft, manipuable composition of the object as if holding it with your real hand. This is obviously a painfully simplistic use-case example, but the potential of such a groundbreaking system is crystal clear. In the same way that VR has an impact on how we work, HaptX’s telerobotics system has the potential to by increase safety in potentially hazardous work environments by allowing professionals to perform dangerous task remotely from a secure environment; and because the telerobotic system lets you feel objects with almost zero latency, the technology could complete tasks that require human instincts or an extremely gentle touch, such as rescuing people trapped under rubell from a collapsed building or assisting in time-sensitive medical operations. What is really thought-provoking is that the team is also exploring the idea of telerobotics feeling pain. Naturally, some might ask wonder why on Earth you’d want robotics to feel pain. The reason behind this idea is to protect the mechanics of a robot by letting users know they might be pushing the limits of the device too far, and are at risk of possibly damaging the mechanism; which you can bet, is probably pretty expensive. Their biggest hurdle is trying to figure out how robots would feel pain, and then calculate how that pain would then translate back to the user. As weird as that sounds, it makes sense from a business point-of-view. The next step for the HaptX team is to integrate a VR headset and 360 stereoscopic video capture system that would allow for the visual component of telepresence, and then use 5G to help improve the networking component of teleoperation. Hopefully one day we’ll all be able to enter VR nightclub from the privacy of our homes, while our load-lifter robotic extensions are clanking away on the dance floor somewhere in London. Oculus arbeitet derzeit an neuen Enterprise-Editionen der beiden VR-Brillen Oculus Go und Oculus Quest, wie ein kürzlich veröffentlichtes Stellenausschreiben bekannt gibt. Während die Quest-Brille in der normalen Variante erst im Frühjahr 2019 erscheinen wird, ist von der Oculus Go bereits ein Business-Bundle für Unternehmen verfügbar. Die Enterprise-Versionen sollen noch 2019 erscheinen. Ein Sprecher von Oculus bestätigte gegenüber Variety, dass die Produkte im Zuge des Business-Angebots des Unternehmens entwickelt werden. Innerhalb des Anforderungsprofils an die Jobsuchenden kann man einige mögliche Features der neuen Versionen der VR-Brillen herauslesen. 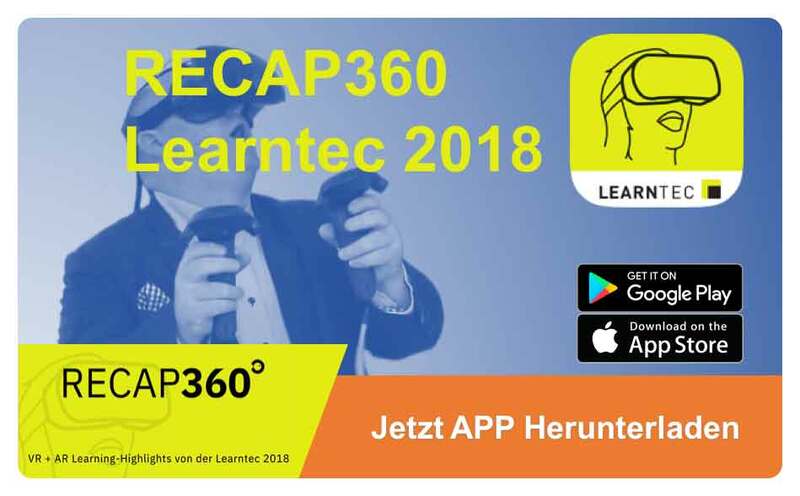 Demnach gehört es zu den Aufgaben der Devs, Enterprise-Features für Apps und mobile VR-Systeme sowie VR-Frameworks für praktische Anwendungsfelder in Unternehmen, wie beispielsweise VR-Trainings, zu entwickeln. Sicherheitsmaßnahmen zum Datenschutz werden ausdrücklich hervorgehoben. Ebenso soll mit externen Entwicklern für zukünftige Projekte zusammengearbeitet werden. Somit tritt Oculus in direkte Konkurrenz mit HTC rund um das Business-Segment. HTC kündigte erst kürzlich seine Vive Focus Plus mit 6DoF-Controllern an, die ebenfalls für den Einsatz in Unternehmen infrage kommt. Weitere Informationen rund um die neuen Editionen der VR-Brillen könnten uns auf der kommenden GDC 2019 im März oder spätestens auf der Entwicklerkonferenz F8 2019 von Facebook Ende Apri bzw. Anfang Mai erwarten. Entertainment: an indispensable part of everybody’s life. Bmotion Technology takes it to a new level of fun and excitement. As a Virtual Reality (VR) simulator manufacturer, the company gives an opportunity to experience new worlds and break away from the daily routine. The company’s background in operating different motion-simulator rides has helped create products that can be imagined and innovated only from experience. The main concept is to build products that are useful from several stand points. Customers need to have an outstanding experience. Operators need to enjoy the process of maintaining and running the equipment. And the setup process must be seamless and smooth. All of Bmotion Technology’s products have this philosophy in mind. “People love entertainment. They are looking for it. To find great rides you would need to travel far to an amusement park, plan ahead, and sometimes make multiple day trips. The budget for the trip can be high. But what if a great ride experience can be found in the nearest mall? We believe that if you make entertainment more flexible, reachable, affordable, and exciting you can change the way it is delivered.” says Illia Balashov, Bmotion Technology founder. Bmotion Technology has a team of versatile specialists with complementary skills and experience combining software, hardware, and business professionals. In 2014 the team was involved in a project of launching multiple location-based entertainment stores in the USA, including some of New York’s busiest shopping centers. Based on this experience and knowledge of operating different equipment a new generation of rides and software was developed. Bmotion Technology offers a wide range of products that can meet most of the requirements and requests in the VR market. Portable solutions, like the RockerVR, are perfect for on-the-go events or smaller spaces. For those wanting to ride with friends and family, Bmotion Technology has the multi-seat Turbo Ride. 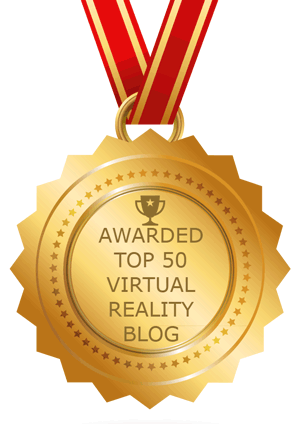 In addition, the company offers solutions for location-based VR with Real Virtuality Club: a VR boutique aimed at bringing high-quality unique VR entertainment. Any ride can be used on its own or in tandem with multiple devices, all while remaining operated by the same control software. All of the company’s rides maintain the highest standards of safety. And Bmotion Technology offers a comprehensive solution for a location-based VR entertainment boutique including Point of Sale integration, statistics backend, and other important features to run and manage the business. With constant development and a creative approach, Bmotion Technology advances and builds products and features that make VR entertainment outstanding. Bmotion Technology was founded in 2014 as a hardware design and development project to build motion simulators and rides for the entertainment segment. Bmotion Technology also offers all kinds of hardware/software projects as well as turnkey business solutions for location-based VR entertainment. Company headquarters and manufacture is located in Ukraine and projects are done worldwide. To significant anticipation, Microsoft revealed HoloLens 2 earlier this week at MWC 2019. By all accounts it looks like a beautiful and functional piece of technology and a big step forward for Microsoft’s AR initiative. 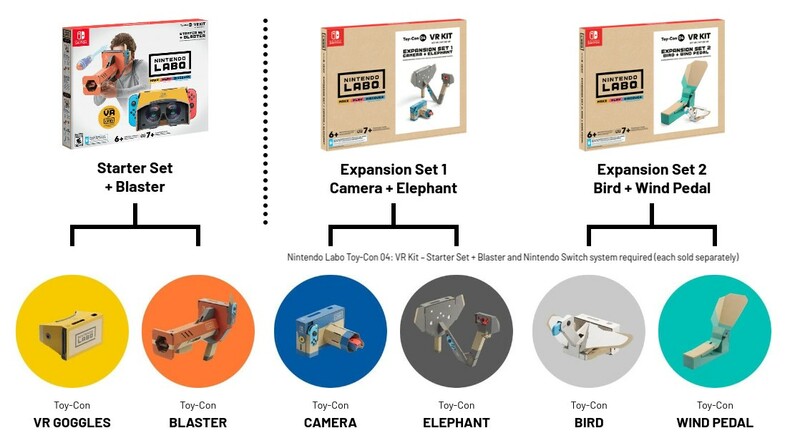 All of which makes it unfortunate that the company didn’t strive to be clearer when illustrating one of the three key areas in which the headset is said to be improved over its predecessor. On stage this week at MWC 2019, HoloLens visionary Alex Kipman was the one to officially reveal HoloLens 2. The headset, he said, delivers improvements in three key areas that customers of the original headset had consistently asked for: field of view, comfort, and business ROI right out of the box. For field of view—how much of your view is covered by the headset’s display—Kipman said that HoloLens 2 delivers “more than double” the field of view of the original HoloLens. “More Than Double” …What, Exactly? Within the AR and VR markets, the de facto descriptor used when talking about a headset’s field of view is an angle specified to be the horizontal, vertical, or diagonal extent of the device’s display from the perspective of the viewer. When I hear that one headset has “more than double” the field of view of another, it says to me that one of those angles has increased by a factor of ~2. It isn’t perfect by any means, but it’s how the industry has come to define field of view. But ok… I get it. Field of view area isn’t a bad way to compare headsets by any means, if somewhat peculiar compared to how other companies rely this information. Not the end of the world. But then Kipman moved onto a part of the presentation which visually showed the difference between the field of view of HoloLens 1 and HoloLens 2, and that’s when things really became misleading. 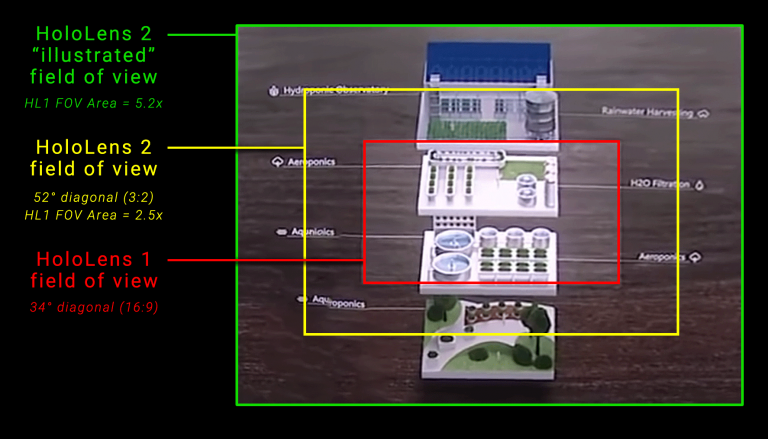 In the center of the image Microsoft showed the HoloLens 1 field of view, and then drew out the edges of the image to show how much larger the HoloLens 2 field of view was by comparison. Except it was hugely exaggerated. The difference between the actual field of view and what was presented is not just a little bit wrong… it’s like, way wrong. Microsoft made a big deal about the “more than double” increase (in area) compared to HoloLens 1, but managed to misrepresent the difference by an even larger margin, showing a 5.2 times area increase over HoloLens 1 in the visual. What makes this even more unfortunate is that they attempted to show how the wider field of view would let you see more of a virtual object, but the actual HoloLens 2 field of view in this case would have truncated the example on all sides. When I asked Microsoft about this, I was told that what was shown just an “illustration,” and only a brief part of the presentation. But it seems surprising that they didn’t take more care to faithfully represent one of the headset’s most important improvements, especially considering this is the only means of comparison short of actually having a HoloLens 1 and 2 in front of you to try. Initially when I went asking through official Microsoft press channels for specifics on the HoloLens 2 field of view, I was told that “more than double” HoloLens 1 is all the information that would be shared for the time being. When I took to Twitter to air my frustration at the lack of clarity (especially considering that the stated “more than double” was relative to the HoloLens 1 FOV which Microsoft had also been coy about sharing) Alex Kipman responded by pointing to a huge Wired pre-reveal feature article published this week where he confirmed a 34 degree diagonal field of view (16:9) for the original headset, and a 52 degree diagonal (3:2) for HoloLens 2. But even in an in-depth pre-reveal briefing, Microsoft still didn’t manage to accurately convey the field of view message; the Wired piece reports that the “diagonal field of view has more than doubled” on HoloLens 2—the same thing most people reasonably thought when the company said it on stage this week. This isn’t the first time that Microsoft has been called out for doing a poor job of representing the HoloLens field of view. When the original headset was revealed back in 2015, the company used (admittedly very cool) mixed reality compositing to show a third-person perspective of all the virtual objects floating around the user. This was billed as ‘what the user sees,’ but left out the important detail that with such a small field of view there is significant truncation that is not shown. Microsoft later began adjusting many of its HoloLens marketing visualizations to be more clear about what how the user-perspective actually looked and was impacted by the field of view limitations. To be clear, this isn’t the end of the world. Companies try to present their products in the best light, and oftentimes that involves stretching the truth. It isn’t clear if Microsoft was being intentionally misleading, or if someone just made a bad mockup, but it does mean that if the only thing you saw was the HoloLens 2 reveal presentation, the field of view is actually significantly smaller than what was shown on stage (and for anyone curious, nearly identical in size to that of Magic Leap). This will be forgotten in time; HoloLens 2 will go on to do great things. But misrepresenting the field of view doesn’t make it bigger, and people are still going to be asking for even more field of view from HoloLens 3 and beyond. So in the meantime, Microsoft, why not just aim for accuracy and let the device speak for itself. Steuerung des eigenen Arbeitsplatzes über Augen, Stimme und Hände ist keine Fiktion mehr. Gestern Abend hat Microsoft die Hololens 2 vorgestellt. Kern der Verbesserungen sind neben vielen technischen Verbesserungen und Erweiterungen auch die Weiterentwicklung der Softwaredienste rund um Azure. Hier z.B. Dynamics 365 Guides zu nennen, hier können Arbeitsprozesse und Schrittabfolgen einfach erstellt und interaktiv visualisiert werden. Kontextsensitive Hilfe und Performance Support lässt grüssen. Auch die Integration in die Cloud über Azure ist zentraler Bestandteil für das live Abbilden und Rendering von 3D-Objekten. Für mich waren die Funktionen rund um das Thema Collaboration mit anderen Nutzen im virtuellen Raum sehr spannend. Hier werden Hologramme der anderen Personen erzeugt und visualisiert. Auch wird über Dynamics 365 Remote Assist das ganze Thema Wartung/Support in der Industrie in die Standardsoftware der Hololens integriert. Im Lernprozess können hierüber z.B. Experten, Coaches oder Trainer zugeschaltet werden. Doch kurz zurück zu den Hardwareverbesserungen, die Microsoft Hololens 2 verdoppelt das Sichtfeld, erkennt die Hände und die einzelnen Finger, hat Eye-Tracking, hat eine Laufzeit von ca. 2…3 Stunden und ist leichter und ergonomischer. Insbesondere die Interaktionsmöglichkeiten z.B. das direkte Anfassen von Holographischen Objekten und die neuen Interaktionen z.B. bei holographischen Buttons haben mit sehr gut gefallen. Lerner aktiv einbinden in den Lernprozess und das darstellen interaktiver Elemente sind aus meiner Sicht eines der entscheidenden Faktoren, wenn es um den Erfolg rund um Mixed Reality geht. Kurzum im Lernen wird sich über Microsoft Hololens 2 einiges neu Umsetzen lassen, dass für die Lerner sich in der Bedienung und Anwendung natürlicher anfühlt. Natürlichen müssen sich die Hardware- und Softwareneuerungen erst in der Umsetzung beweisen, aber das was gezeigt wurde sieht sehr vielversprechend für den Lern- und Trainingsbereich aus. Insbesondere in den 70- und 20-Prozent des 70-20-10-Ansatzes sehr ich hier einen Mehrwert. Der User stand hier im Mittelpunkt der Überlegungen, diesen Eindruck hatte ich in der Präsentation. Microsoft hat natürlich durch die vielen Pilotprojekten mit Unternehmen hier sehr viel Feedback bekommen und aber dieses anscheinend auch in die Produktentwicklung einfliessen lassen. 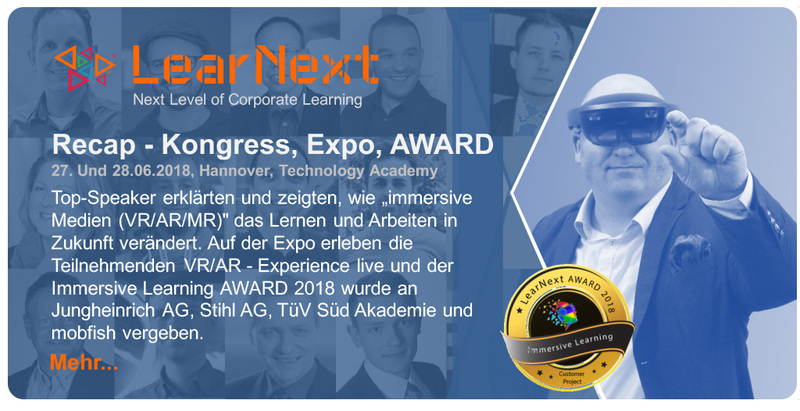 Ich freue mich, auf die neue ja was eigentlich – auf die nächste Stufe der XR- oder MR- oder Spatial-Brille. 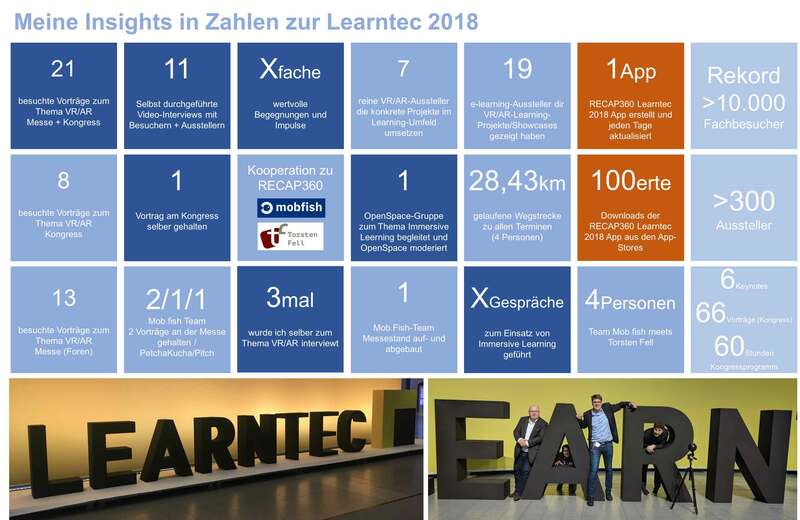 Diese kann in allen Branchen ein guter nächster Schritt werden, neue Interaktionsformen, neue Collaborationszenarien und Visualisierungen zu realisieren, aus diesen Gründen auch für das Lernen/Training sehr spannend. Für Unternehmen ist natürlich die Integrationsfähigkeit in die bestehende Infrastruktur ein wichtiges Thema – verstehe ich. Nun sind alle gespannt auf die neue Hardware in Live zu testen, ich auch. Her damit. 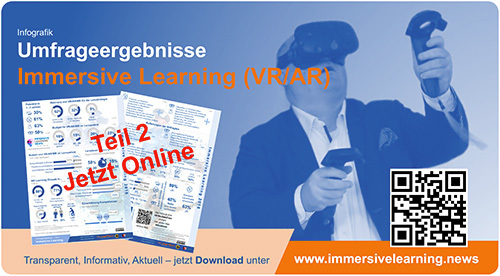 Dies war ein wichtiger und notwendiger Schritt, damit Mixed Reality im B2B-Umfeld sich weiterentwickeln kann und im Lern- und Trainingsumfeld nächste Anwendungsfelder umgesetzt werden können.